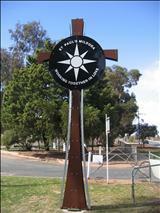 Mildura is located in north-western Victoria on the banks of the Murray River. It is approximately 5½ hours drive from Melbourne or 4½ drive from Adelaide. A number of regional airlines (including REX, Qantas and Virgin Blue) service Mildura from Melbourne and Adelaide. Coach travel and train links are also available from major cities. St Paul's is centrally located in the growth area of Mildura on the corner of Fourteenth St & Etiwanda Ave.
We draw our enrolments from the Mildura South, Irymple and Nichols Point areas as well as Gol Gol and Buronga in NSW. Enrolments to both parish primary schools (St Paul's & Sacred Heart) are zoned and this is determined by place of residence.